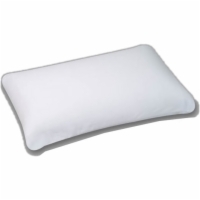 This pillow is made from 4 pound visco-elastic memory foam and is in a traditional pillow shape. It comes with a removable terry cover that is easily zipped on and off. Standard Size: 16" x 24" x 5.5"
King Size: 16" x 32" x 5.5"
Standard, 16" x 24" x 5.5"
King, 16" x 32" x 5.5"